If you've been longing to witness the destruction of Los Angeles and San Francisco in glorious 3D, San Andreas delivers the goods. But the digital carnage may leave you feeling empty, because in every other respect — story, characters, dialogue — the film flatlines. It's a snooze enlivened by regular orgies of heavy stuff falling on people. Granted, no one goes to disaster movies for story, characters or dialogue. But most of them still manage to provide campy entertainment, usually by filling the screen with a colorful ensemble of archetypes. In theory, these stock characters represent the breadth of people drawn together by a disaster. In reality, they just give us lots of opportunities to lay odds on death or survival. 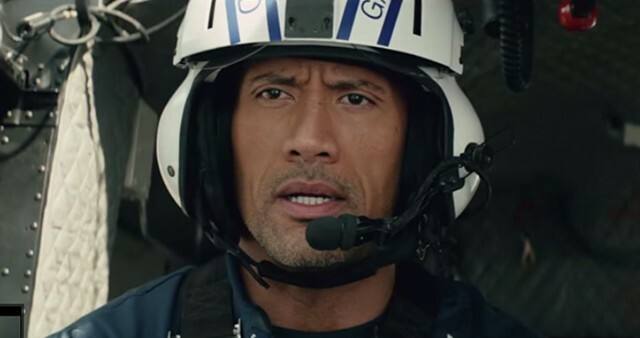 Directed by Brad Peyton (Journey 2: The Mysterious Island) and scripted by Carlton Cuse ("Lost"), San Andreas takes a more minimalist approach. It asks us to invest all our interest in the survival of a single family — granted, a family of extra capable and good-looking people. That's still a lot of confidence to place in the charisma of Dwayne Johnson, who plays LA helicopter-rescue pilot and Afghanistan veteran Ray Gaines. Just like John Cusack in 2012, Ray's estranged from his wife — played by Carla Gugino — which means the rupture of California's notorious San Andreas fault can serve a handy-dandy marriage-counseling function. The pair have a grown daughter, Blake (Alexandra Daddario), who looks barely younger than they do, and a past trauma that drove them apart. While an earthquake collapses the Hoover Dam, Blake heads to San Francisco with her stepfather-to-be, star architect Ioan Gruffudd, who unctuously proclaims that he's never started a family because he regards his skyscrapers as his children. If this doesn't tip you off that the guy will die hideously as his "offspring" fall into rubble, then you've never seen a disaster film. It's hard to spoil San Andreas, because every moment in it is just that predictable. Paul Giamatti plays the requisite visionary seismologist, and Archie Panjabi is a reporter, but neither does much besides gape as a freak confluence of faultlines produces the Big One. Giamatti promises the quake will be felt all the way to the East Coast — but, sad to say, Peyton never gives us an absurd cutaway to New Yorkers or Bostonians cringing at the tremors. Instead, he holds our focus on the painfully dull Gaines parents as they team up to rescue their daughter from San Francisco. No doubt the purpose of that tight focus is to immerse viewers in the action, video game-style. Ray resembles a game protagonist as he conquers obstacles, collects resources and moves from one form of vehicle to the next — often traveling by air, to give us bird's-eye views of the ruin. And those views are impressive, especially if digital dust is your thing. Peyton offers ample fodder for connoisseurs of havoc: The fate of the Golden Gate Bridge (yeah, you knew that was coming) certainly inspires more awe and terror here than it did in "10.5," the 2004 NBC mega-quake miniseries to which San Andreas bears more than a passing resemblance. Peyton and Cuse appear to have decided that, since we all know the tiny figures tumbling from skyscrapers are merely animations, the film shouldn't force us to pretend we see them as people. Maybe they've forgotten the lesson of Pixar: A good story can make us care about anything. San Andreas is not showing in any theaters in the area.